Gift of J. Pennington Straus, A.B. 1932, LL.B. 1935, August 1991. The miscellaneous and unidentified consists of one folder containing unidentified materials. Both series are arranged alphabetically. George McClellan, b. 22 December 1796, Woodstock, Conn.; d. 9 May 1847, Philadelphia. Son of James and Eunice (Eldredge) McClellan. A.B. Yale, 1816; M.D. Penn, 1819. Founder of Jefferson Medical College. Married, 14 September 1820, to Elizabeth Steinmetz Brinton, b. 15 March 1800, d. 18 August 1876, daughter of John Hill Brinton of Philadelphia. 1. John Hill Brinton McClellan, b. 13 August 1823, Philadelphia; died 20 July 1874, Edinburgh, Scotland. A.B. 1841, A.M. 1844, M.D. 1844, Univ. of Penn. Married Maria Eldredge, daughter of Oliver Eldredge of Boston. John H. B. McClellan spent his medical career in Philadelphia. Among other positions, he served as Professor of Anatomy at Pennsylvania’s Medical College in 1955. He was a surgeon at three different Philadelphia hospitals from the years 1850-1865. He became a member of the Academy of Natural Science in 1847. George McClellan was born in Philadelphia, the son of John Hill Brinton McClellan and his wife Maria Eldredge. Like his father, who got his M.D. from the University in 1844, he attended the University in 1865; however, unlike his father, left in 1869 without obtaining a degree. In 1870, he received his M.D. from Jefferson Medical School, which his grandfather George McClellan founded. After studying several years in European hospitals, George returned to Philadelphia to work as a surgeon in the Howard Hospital and later in Philadelphia General Hospital and Saint Joseph’s Hospital. In 1879 he created the Pennsylvania School of Anatomy and Surgery, his two specialties. His interest in anatomy was also applied to art. Being a noted illustrator, three pieces of which are found in this collection, he lectured on anatomy and art at the Philadelphia Academy of Fine Arts. In 18– he married Harriet Hare, the daughter of Robert Hartford Hare. They do not appear to have had any children. George McClellan died at his home in Philadelphia in 1913. 2. George Brinton McClellan, (1826-1885). George B. McClellan is well known for his service as the leader of the Army of the Potomac during the Civil War. He was the brother of Arthur and John Hill Brinton and the uncle of George. George B. also attended the University of Pennsylvania from 1840 to 1842; however, he did not graduate and chose instead to enter United States Military Academy at West Point, from which he graduated in 1846. He served as chief engineer of the Illinois Central Railroad in 1957 and worked his way up to become the President of the St. Louis, Missouri and Cincinnati in 1860. He became Commander-in-Chief of the United States Army in 1861 and Commander-in-Chief of the Army of the Potomac in 1862. He resigned as Commander-in-Chief in 1864 and became the Engineer-in-Chief of the Department of Docks in New York City. In 1877 he became the Governor of New Jersey until 1878. He married Mary Ellen Marcy, daughter of Brigadier-General Randolph Barnes Marcy. Arthur McClellan was born in Philadelphia on 23 September 1839, the son of George McClellan, M.D. (U. of P. 1819) and his wife Elizabeth Steinmetz Brinton. He attended the University of Pennsylvania and graduated from the college in 1858. After had received his A.M. from the University in 1861, he enlisted in the army during the Civil War. He served as an assistant to his brother, the well-known head of the Army of the Potomac, General George B. McClellan. There are two items in the collection which relate to his Civil War service. After the war he went to work for his cousins, through the Brinton family, at the Coxe Brothers and Company, coal operators, in Drifton, Pennsylvania. He died, unmarried, on 22 February 1904 at Drifton. 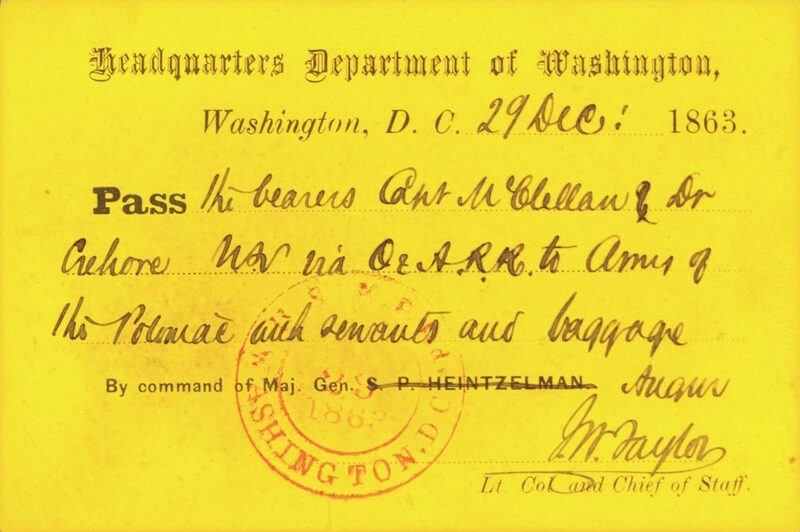 This small collection largely consists of correspondence written to or from members of the McClellan family. Within the correspondence series (1862-1913), the Arthur, George, and George B. McClellan folders consist of personal letters; however, the Mrs. Robert Harford Hare and some of the Mrs. George McClellan folders contain business letters. Subjects of the correspondence series include family real estate transactions, the family insurance business, medical practice, travels and general personal notes. The conversation notes folder within the conversation series contains a group of small pieces of paper in which two people communicated to one another in writing, perhaps as a game. The folder in the miscellaneous and unidentified series (no dates) contains one photograph, possibly a tin type of two adults, a girl and a dog. This folder also contains an unaddressed, unsigned letter written in French; a poem with an unknown author and a pamphlet. Scribbled messages between two unidentified people. Undated. Cartoons, hand-drawn depicting a patient before and after medical consultation (2). Undated. Letters to George McClellan (1849-1913) from John H.B. McClellan regarding travels and business. Undated. Cartoon, hand-drawn of man and woman. Undated. Tin type, unidentified French letter, songs, pamphlet. Undated.